Location: The site is lost under Armstrong Close. Notes: The single-storey terminus at Newmarket was imposing; Biddle (1973) considers it a prime example of an elaborate terminal station serving a small branch-line company out of all proportion to the company’s size, importance and capital. He describes it as possessing incredible classical opulence, and considers that nothing quite like it appeared before or since on Britain’s railways. 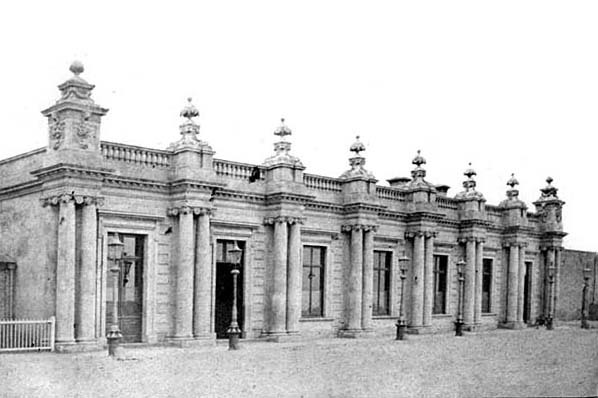 It was composed of three buildings and had, at the end, a severely practical goods shed next to an Italianate station house and, first in line, what has been described as a ‘Baroque orangery’. This remarkable structure boasted a succession of tall, finely hooded windows, interspersed with coupled Ionic columns, all rising above a deep cornice to richly ornamented caps. There were seven bays in ashlar stone. The architect is likely to have been either Philip Hardwick or John Braithwaite, the latter being responsible for many of the buildings on the line. 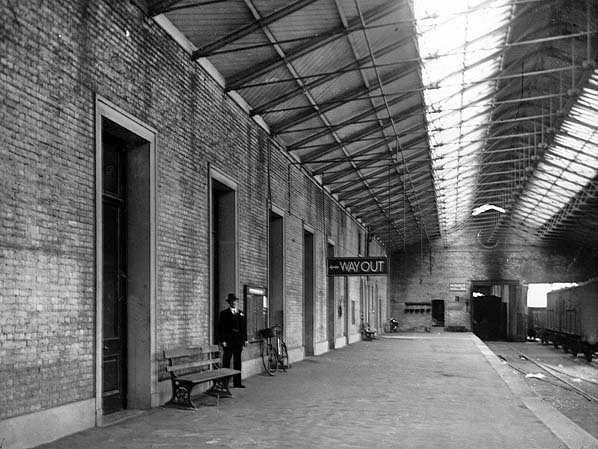 There was a single platform covered by a trainshed at its north end: the decorative front of the trainshed was removed circa late 1930s. An island platform was later provided outside the trainshed for use by excursions on race days. It was provided with a long, flat canopy for protection from the weather. Beyond the passenger platform, track continued through an opening in the rear wall directly into a brick goods shed. The coal yard was to the south of the station on the down side. On the up side were a signal box stables and an engine shed. The history of the engine shed is not clear. The Newmarket Railway had its own locomotives so there must have been an engine facility of some kind when the line opened, but this may have closed when the Eastern Counties Railway leased the line in October 1848. In 1880 the Great Eastern Railway opened a timber single-road through engine shed with a 45ft turntable, water tower (fed from a nearby well) and workshops; it housed one 0-6-0 loco. This was demolished in 1932 to make room for a new 60ft turntable required for the larger locomotives in use at that time. 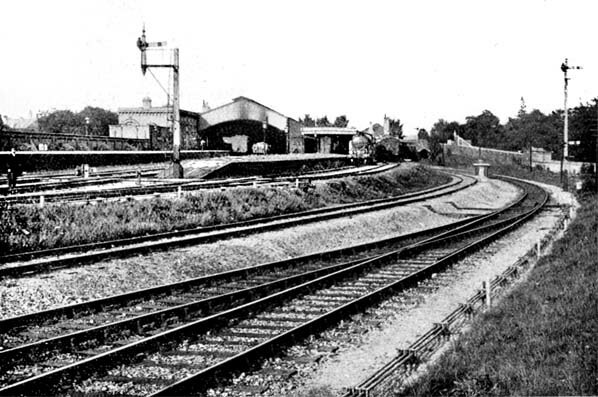 This stabling point remained in use until the early 1960s, but by that time the turntable was insufficient, and engines were turned using the Warren Hill/Snailwell Junction/Chippenham Junction triangle. When the line from Newmarket to Ely opened on 1 September 1879, bringing additional through traffic, the awkward reversal was avoided by opening a new island platform at a slightly lower level to the east of the original terminus. The new platform was usually referred to as the Lower station. For some years Newmarket was, in effect, two separate stations although they did share a restaurant. The original single upper platform was used by trains from Cambridge terminating at Newmarket while the lower island was used by through trains to Bury and Ely. The two platforms were joined by a footbridge at the north end. The through platform was sheltered by a canopy. 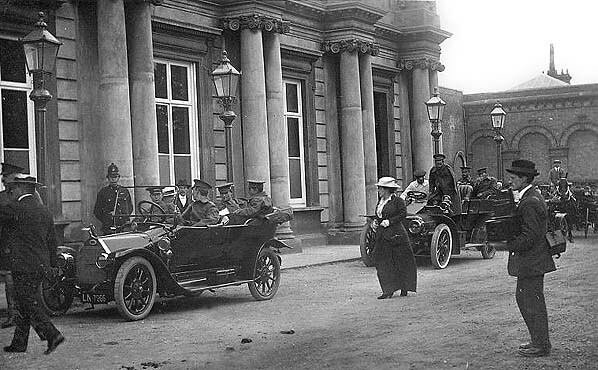 Newmarket was home to all the major British racing and training stables which meant there was constant inward/outward traffic in horses going to and coming from race meetings all over the country. Added horse traffic came from the annual sales at Tattersalls in December and the bloodstock sales which took place at the spring, summer and autumn race meetings. Around the turn of the twentieth century around 12,500 horses were being dealt with annually. Newmarket station was replaced with a much larger facility half-a-mile south on 7 April 1902. The new station had limited goods facilities and the old terminus was retained as the town's goods station. 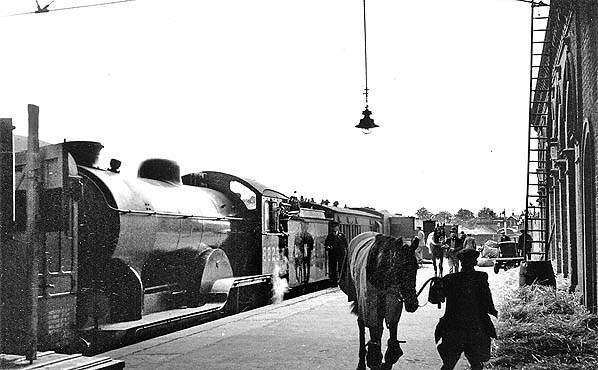 After closure to passengers the old station continued to deal with increasing horse and general parcel traffic, but the passenger platform was retained for race specials and was also occasionally used by grooms accompanying horses until at least 26 July 1954. 25 horse boxes could be accommodated at one time in this platform with a further 50 in the adjoining island platform which was also used at busy times, such as the December horse sales. The adjacent goods and shunting yard grew over the next decades; heavy horses were used for shunting individual goods wagons and were stabled adjacent to the turntable. During the early part of World War 1, large numbers of troops were present in Newmarket, with tented camps set up on Warren Hill and other parts of the Heath. The railway and goods yard were busy moving troops and armaments and the old station building was used as a temporary hospital for wounded soldiers. After a decline in traffic in the inter-war years the goods yard was once again busy during World War 2 handling armaments including tanks and armoured vehicles. In addition thousands of tons of road-making and building materials for the many airfields being constructed in East Anglia were dealt with. Race meetings continued throughout the war years and many race specials had to be dealt with, in addition to the military traffic. The goods yard remained busy through the 1950s and into the 1960s. The trainshed had been demolished by the early 1960s. In 1960 17,461 parcels were handled. Goods leaving the station included caravans, agricultural implements, fertilizers and barley; incoming traffic included coal and paper imported from the USA. Horse traffic remained heavy with 1,073 horses being despatched from the yard and 1,573 received. 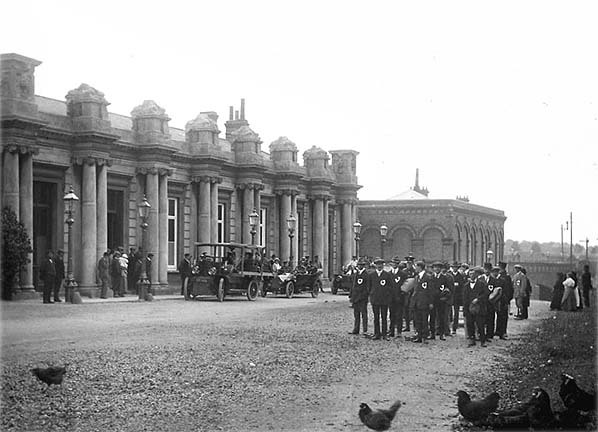 Newmarket was the last British Railways depot to withdraw horses for shunting. They were retained there until 1967 to move special vehicles used for transporting racehorses. Horses had been used to haul vehicles from the earliest days of the railways. Although locomotives could move heavier loads, horses were cheaper and more flexible, so for many years were kept to shunt at small depots. The yard closed on 3 April 1967 and the track was lifted the following year. The buildings survived until 1981. There was an outcry when they were demolished as the colonnaded front of the building was supposed to be listed. Permission to demolish was approved as the building had become too costly to maintain and sufficient funds for preservation could not be raised. 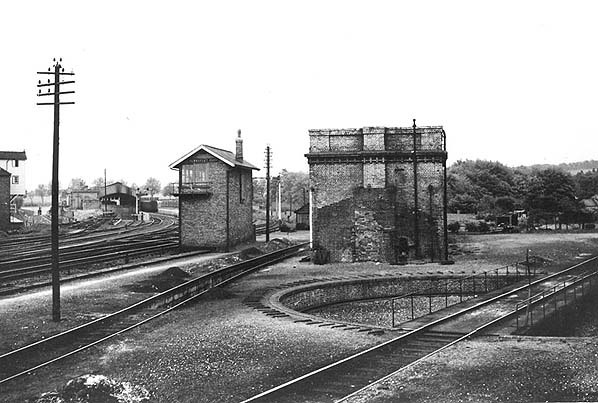 The site has now been lost under Armstong Close which was built on a raised platform that once supported the station. A retaining wall remains behind five cottages, presumably ex-railway cottages on the lower edge of the site, on All Saints Road. This latter road curves round and runs alongside the old station site to its junction with Old Station Road. In 1897 a narrow gauge railway was laid from Cheveley Park to Newmarket station. Cheveley Park is the oldest stud in Newmarket and was owned by John Manners, 5th Duke of Rutland. In 1892 he sold it to Sir Harry McCalmont who later became MP for Newmarket. The narrow gauge railway was laid during the construction of the new Cheveley Hall. The railway was used to haul building materials from the station to the construction site. There are two photos here. Tickets from Michael Stewart. (0621 was issued on 12 August 1899 and is the only ticket issued when the station was open to passengers. The other tickets are for race specials after closure in 1902. Newmarket HL is the old station. Both tickets are to stations the served race courses). Bradshaw from Alan Young. Eastern Counties Railway timetables from Great Eastern Railway Society. Share certificate from Roger Newman. Special thanks to Darren Kitson for his research notes. 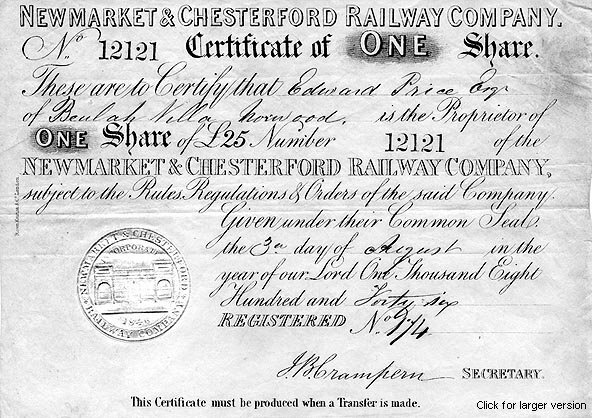 Great Eastern Railway Society for various documents, English Heritage for a free licence to reproduce two photographs and The Newmarket Local History Society for permission to reproduce some text from their web site. 1885 1:500 OS Town Plan shows the layout of the station after the through island platform had been added. The goods shed is located beyond the passenger trainshed which spans the original single platform. The later island platform is seen to the right of the trainshed; the shaded area indicates the extent of its canopy. To the right of that, the 1879 through island platform is seen, again with a canopy for weather protection. A footbridge is sited at the north end of the through platform to the high level island platform. Click here for a larger version. 1902 1:2,500 OS map. The goods yard is to the north of the station with the coal depot to the south. On the approach to the station a private siding serves a malthouse and, opposite, there is a turntable on the approach to a single-road thorough engine shed. A well is shown to the right of the turntable. Looking north towards Newmarket station c1905. The island platform, which was a later addition, was built outside the trainshed. It was mainly used for special excursions on race days and was provided with a flat canopy. The low level through line to Bury St Edmunds and Ely is seen on the right. The two lines converge to pass through the single-track Warren Hill Tunnel. The low level island platform, which had a loop round it, cannot be made out apart from the stairs at the north end of the platform. Wounded soldiers at Newmarket station during WW1. There were also two auxiliary hospitals in Newmarket during WW1; Rous Hospital, and Severals House Hospital. Aerial view of Newmarket station in 1920. The low level island canopy has been removed as this platform was not used after Newmarket’s new station opened in 1902. 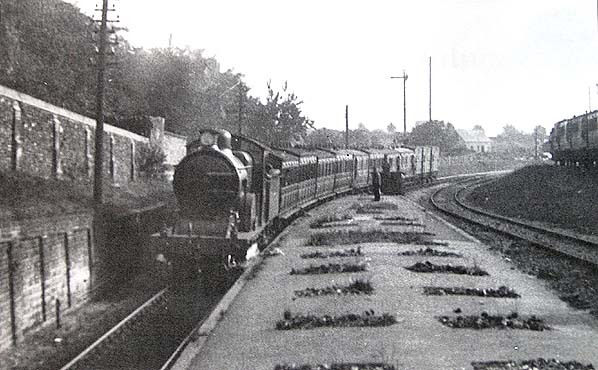 A T19 4-4-0 hauls a northbound passenger train through the 1854 low level through platform at Newmarket c1920s. The station closed 7 April 1902 when Newmarket Warren Hill opened at the north end of Warren Hill tunnel. The loop around the west side of the island has been removed and relaid as a siding away from the platform. Although closed to normal passenger traffic in 1902, the original platform was still occasionally used after that date for grooms accompanying horses until at least July 1954. This picture is c1930s. No.8823 is a Gresley-designed Claud Hamilton D16/3, built by the GER at Stratford works in November 1909. After nationalisation it was renumbered 62574 by BR and withdrawn from Cambridge shed on 31 December 1955 and cut up the following year. This class of loco was used extensively for mixed traffic on the Cambridge - Ipswich line between the 1920s and the1960s. 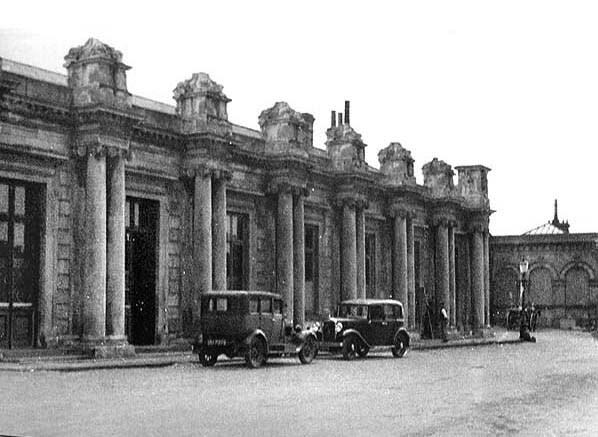 Newmarket station forecourt in the mid 1930s. At this time the station handled only goods traffic and some race day specials. Looking north along the original platform at Newmarket station c1930s. The opening on the left at the back of the trainshed goes straight into the goods shed. 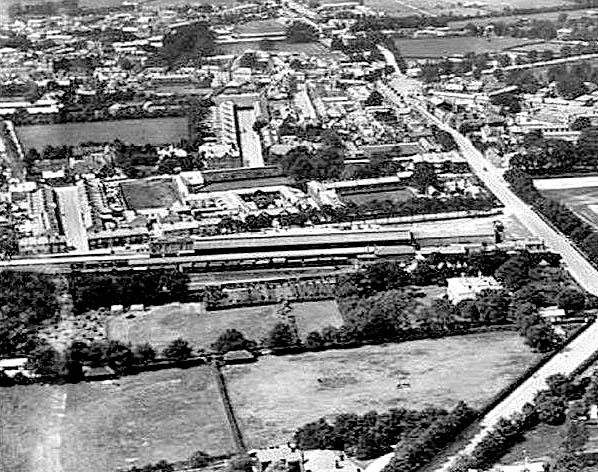 The site of the small engine shed at Newmarket in May 1937. Note how the original 45ft turntable has moved (see 1902 map above) and a new 60ft turntable built. This required the demolition of the shed building and workshop in 1932, leaving just the pit and water tank. The tank was fed from a well nearby. The stabling point seen here remained in use until the early 1960s.